There seems to be no shortage of articles, presentations and research exhorting farmers to lengthen rotations. Longer rotations benefit everything from weed control to disease suppression in crops. But what are farmers doing to maintain or extend rotations? Grainews spoke to three farmers to find out how they’re managing their rotations. And while each farmer is aiming for longer rotations, what that looks like varies between farms. 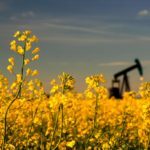 This article is the first in a series. Check future issues for a mid-season update and a harvest recap. Rodney Volk farms near Burdett, a small community southwest of Medicine Hat. His land is just south of the No. 3 Highway, which runs from Medicine Hat to the Rocky Mountains. About half his farmland is irrigated, and the other half dryland. Volk also has a small herd of cattle, and some native pasture. Volk and his neighbours had some moisture in reserve going into the spring. That was fortunate, as it had been a fairly dry spring otherwise, he says. During the phone interview on June 19, the farm was getting a shower. This spring Volk seeded yellow field peas, durum, hard red spring wheat and pinto beans. Marketing is one driver for this rotation. A crop like pinto beans gives him a chance to sell outside the traditional wheat markets, with different demands and buyers. There are also several agronomic benefits. For example, the pulses are treated with an insecticide, and Volk thinks that may prevent insect problems in the early stages with the wheat, as he doesn’t seem to have a wireworm problem. The rotation also allows him to switch herbicide chemical groups, which helps with weed control and cuts herbicide resistance risk. Switching crops also gives him a disease break. Volk says the biggest challenge to his rotation is the specialized equipment he needs for seeding, cultivating and harvesting the pinto beans. The pinto beans are under irrigation. Like most farmers in his area, Volk grows them on a 22-inch row spacing. That space allows farmers to do an in-crop, inter-row cultivation to control weeds and improve water absorption, he explains. Volk uses the same combine on his beans as his other crops, but he has to modify it. During harvest, he undercuts the beans, removing the roots. Some soil is left on the plants, preventing them from blowing away. But the plants still dry down, as undercutting kills them. It also kills many weeds that may have emerged during the second flush. Volk has had this rotation for about six years, but he’s always on the lookout for ways to add another crop. It’s a matter of figuring out everything from equipment needs to storage capabilities, he says. Bernie McClean farms near Medstead, which is about an hour’s drive northeast of North Battleford. The northern location means a short growing season. This year, his annual crop rotation includes canola, Canada prairie spring (CPS) wheat, malt barley and oats. 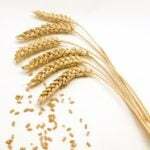 Malt barley is McClean’s specialty crop. He seeds it first and tries to harvest it early. And while his CPS wheat usually makes milling grade, there are ethanol plants and a feed mill nearby. That gives him more marketing options. McClean and his neighbours have been farming in a wet cycle for the last few years. Wet weather and aphanomyces led to some mediocre pea crops. The production risk pushed McClean to drop peas after 2014, although he does plan to grow them next year. 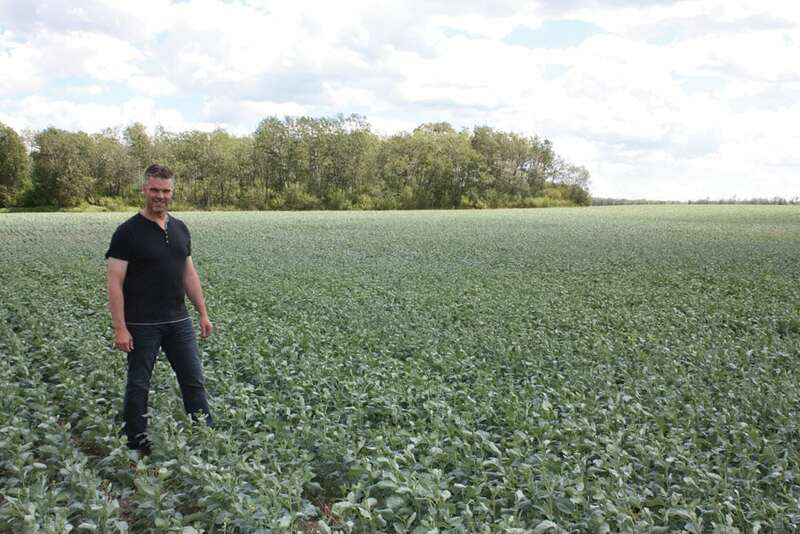 People are trying faba beans in his area, but McClean wants to see earlier-maturing varieties and some work on the marketing side before he jumps in. McClean has tried lots of new stuff over the years, but he’s at the point where he’s going to do what he knows and let others figure it out. “I don’t have to be the innovator all the time,” he says. Still, McClean didn’t want a tight canola rotation, especially since clubroot is present in his crop district. 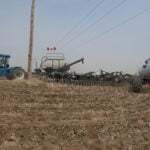 About five years ago, he started seeding his wettest fields to an alfalfa, brome, and timothy mix. 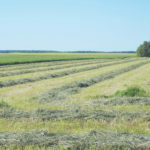 “I want to keep really good, strong hay crops for four or five years.” After that, he will put the field back into annual production for four or five years and keep rotating the hay around his farm. Adding hay means he will only grow canola once or twice in eight years on any given field. The hay mix has some of the same benefits as a legume. There are other benefits, too, such as improved water infiltration. McClean has sold the bulk of his hay to bison producers. This relationship inspired McClean to look at adding bison to his farm. He is now fencing his oldest hay field for bison. He plans to have bison on the farm by January 2019. At first he’ll be renting pasture to an established producer, but over time he plans to build his own herd. Working with an established bison producer will also give him the chance to learn the ropes. McClean has had no problems establishing a hay stand. He doesn’t use a cover crop. Instead he seeds the hay mix and doesn’t cut it until the following year. The biggest ongoing challenge is rain while cutting and baling in July. The first year he faced a bit of a learning curve setting up the hay bine properly and getting the hay up in good shape. But overall, he finds growing hay relaxing. Shaun Cory farms south of Brandon, between Wawanesa and Nesbitt, with his father and son. The Cory farm includes both annual crops and beef cattle. Cory’s farm had seen almost no snow and just enough rain in the spring to keep the crops going. While the crops were doing “quite well” in June, the pastures were just hanging on. The area will need timely rains going forward, he says. Cory says the five principles of soil health govern much of what they’re doing. Those principles include: soil cover; minimal soil disturbance; plant diversity; continual live plant root; and livestock integration. Faba beans have done okay on his farm, despite getting nailed by hail. However, the market is a little thin for fabas, he says. Plus, Cory grows Clearfield canola, and both faba beans and Clearfield rely on Group 2s. Cory says he may try faba beans in the future as an intercrop. Cory’s 2018 line-up includes: fall rye; fall rye/hairy vetch intercrop; Clearfield canola; canola/peas intercrop; pea and oat intercrop as silage for the cattle; flax; spring wheat; soybeans; and oats. After growing canola, they will often seed rye. The rye spreads out harvest and benefits the soil. Usually the rye volunteers (although Cory says this year was an exception). 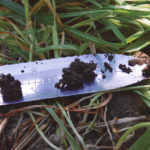 They will often sow soybeans in the rye growth. “Often the growth is knee-high or higher, plus the stubble. We like to keep a lot of cover on the soil,” says Cory. Rye is competitive, which helps suppress weeds. Roundup on the soybeans purges remaining weeds. That gives them a clean field for the next year’s flax. Cory finds the flax doesn’t get weedy when the field hasn’t seen chemical nitrogen applications in the previous couple of years. After the flax, the field goes into canola. However not every field sees rye after canola. Those fields are sown to wheat instead. One challenge is the wheat fields see a Group 2 herbicide two years in a row, says Cory. But often the field won’t have seen a Group 2 for three years prior. After the wheat, the field will often grow pea and oat silage. The silage crop cleans everything off, and keeps them from selecting for herbicide resistant weeds that year. This year they also plan to use an old high-clearance sprayer to seed cover crops into their standing crops. Lisa Guenther is field editor for Grainews based at Livelong, Sask. You can follow her on Twitter @LtoG.